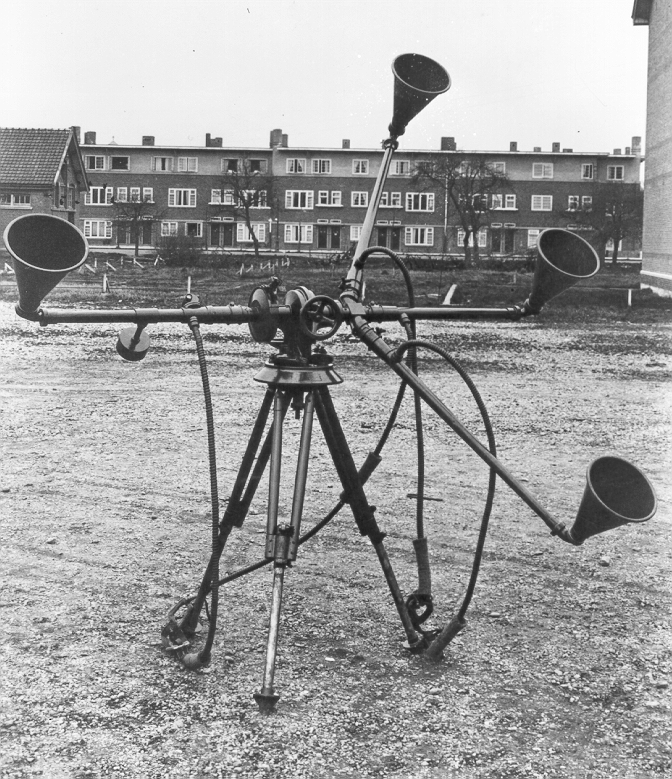 Experiments by the Royal Netherlands Army with listening devices made by foreign manufacturers in the late twenties of the twentieth century showed unsatisfactory performances. The nature of their objections has not been found in written form. But it can safely be assumed that the complaints originated from the clumsiness of the devices which influenced the transport, installation, and accuracy of the measurements. This caused time loss, which was also increased by the time needed to synchronise with other equipment such as searchlights. Moreover, the acoustic properties were far from ideal due to, for example, mechanical noise caused during the use of the device. This made tracking of an observed aircraft difficult if not impossible. The study of this problem was the subject of an assignment from the in 1924 established Commission for Physical Armorment of the Ministry of War to the Measurement Building. A number of details and the progress of this first assignment are still known. That is why the subject will be dealt with more extensively below to illustrate the theoretical and experimental study approach the Measurement Building. 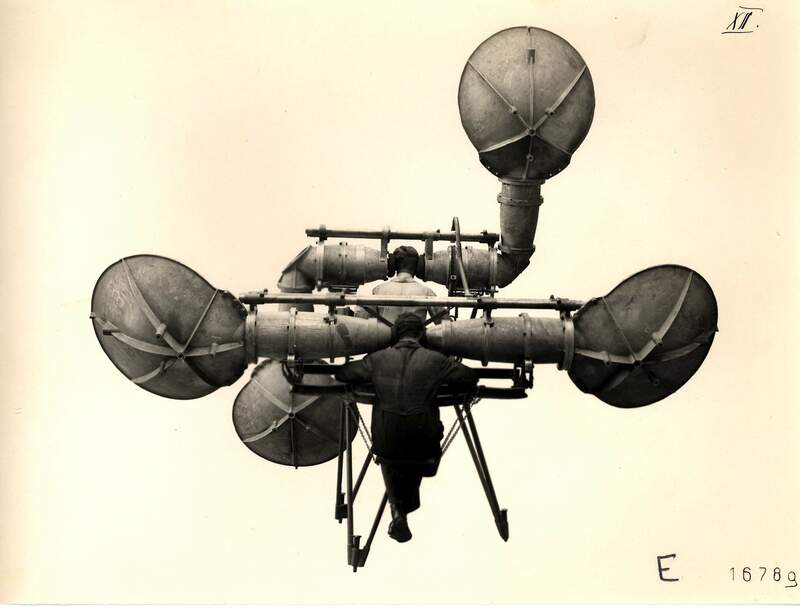 According to the archives, research was initially carried out on the Czechoslovakian listening device made by Görz. Van Soest received half of the device (horizontal listening part) from the Sappers (Wapen der Genie) of the Dutch army. He determined that the bearing of the device made so much noise that the aircraft to be observed was poorly or not heard during such an angle change. This noise was caused by the large weight resting on the bearings when the map angle and/or elevation changed. An aeroplane was therefore difficult to follow with the device. Moreover, the tubes that transported the sound of the hearing shells to the ears of the observer gave a great damping and distortion of the sound. Van Soest discovered that this device contained a fundamental shortcoming, namely the diagonal placement of a set of listening shells. The result was “an incorrect lateral positioning with small elevations results in a 1.6 times larger error in the vertical direction.” It was then decided to manufacture a new, own prototype at Waalsdorp. This development was then compared with the Goertz and two other listening devices: the Doppelt Richtungshörer and the Barbier, Benard, and Turenne device, which gave the same negative results. Doppelt Richtungshörer, manufacturer Askania, Germany. The Measurement Building in the background.